If you've played any GTA game on your Android before you know that Rockstar Games delivers the most true-to-console open-world action gameplay you'll find anywhere. Grand Theft Auto San Andreas for Android is no exception. This port brings the classic game onto mobile phones and tablets in HD graphics and with the same action-packed gameplay experience you loved on PC. 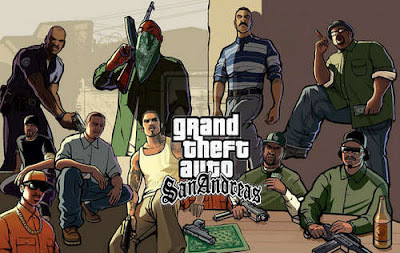 Free download Grand Theft Auto San Andreas Apk Mod with Sd Data files 1.08 / 1.03 (paid full versions) for your Android from Google Drive link given below. 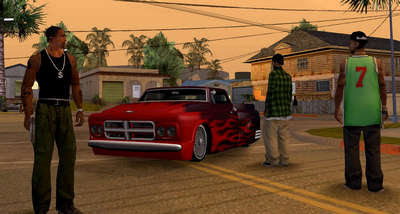 Now, for those of you unfamiliar with the game, it's similar in gameplay to GTA Vice City, but it tells the story of Carl Junior Johnson, a reformed ganster with a grudge. Carl left the city of Los Santos, San Andreas to escape the gangsta life only to find himself back in the hood after his mother's murder which later is pinned on him. In this game you play as CJ as he tries to clear his name and help his former gang rebuild their ranks. Install Grand Theft Auto: San Andreas apk and get a taste of the ultimate sandbox game combining all action gameplay elements in one place. It is a massive open world gaming delight featuring everything from gang wars to night club dancing, massive deserts to drive over to VTOL fighter jets to cause mayhem with. The game's Android control scheme is impeccable considering how much varied character movement is involved in Gta. The virtual stick, slider and tilt controls are perfect when driving or moving around the 3D environments. The player can tap on any character to target and shoot them. GTA SA also supports the MOGA mobile controller but may not work as well as intended. Now stop what you're doing, find some WiFi, and grab your free copy of the full version game. Some users may prefer v1.03 so I've added it below, enjoy! Install the Apk or mod file, Extract sd Data using 7Zipper on Android or peazip/7zip on pc, Copy the resulting data folder to SDCard/Android/obb/, and play offline! 3. Open the cheater and browse to the game slot that you have just saved. 4. Select the cheats you want to use and save. 5. Go back to the game and load the save. GTA SA require a fairly powerful device with 2.4GB of free storage to run properly as it is a graphically-rich game. You might want to reboot your Android device after downloading and installing Grand Theft Auto: San Andreas Apk. Closing other background apps is recommended!